A couple of weekends ago, we were crouched over a “Boss” burger and a bowl of Kerbey Queso when the server dropped off a frosty carafe full of a perfect pink drink at the table next to us. I contained my squeal but my “OHMYGODINEEDTHATRIGHTNOW” face was met with a silent, disapproving head-shake. After like 10 years, we now mostly communicate with a series of eyebrow movements, squinty faces, and throat clicks. But one of us decided to be an adult about things. And then that one of us changed her mind and crushed an entire carafe of Grapefruit Mimosas on a school night. Because one of us probably will never grow up. And one of us is okay with that. They’re delicious and dangerous. So pretty much everything you want need deserve in a drink that’s acceptable to pound before noon. Pretty pink mimosas made with prosecco and Texas grapefruit. 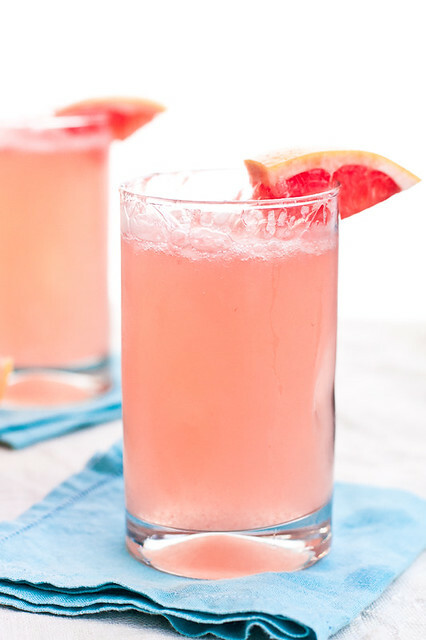 Add the chilled Prosecco and grapefruit juice in a large pitcher (one that can handle 8 cups of liquid + a couple inches of Prosecco foam). Gently stir in your favorite sweetener to-taste, if desired (I added a couple of drops of liquid stevia per glass). That looks absolutely delicious! It was the right decision to change your mind, growing up is boring! I would have completely shared in your enthusiasm over this drink. I LOVE Mimosas, and we love grapefruit in out house. Plus, who could resist that beautiful pink loveliness?! 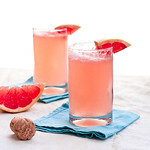 I just LOVE grapefruit – these look so refreshing and yummy! Kerbey queso AND grapefruit mimosas? Sounds like my ideal meal! What a beautiful beverage. I’m so glad that one of you decided to cave to the craving! And that same one of you decided to share it with us! Prosecco and grapefruit sounds so delicious! I can’t wait to try it!!!! And beautiful pictures btw. So stunning. Loved your article, made me giggle since ‘one of you’ sounds just like me 😉 Cheers! We’re you at Kerbey Lane Cafe?! We loved visiting Austin when we lived in Houston and KLC was always a MUST! My tennis tea am drinks this champagne drink on Friday mornings when we’re warming up…we heard it was called a Moonwalk. Delicious! Sure was! Love love love Kerbey Lane! Mmm these sound great. I’ve done half-and-half OJ and grapefruit juice, but I think I need to try it with all grapefruit. You know, for research purposes. This is such a great idea – I love a pink cocktail! We’re having these for Mother’s Day tomorrow! We love your recipe! I was wondering if we could share it on our social channels and we would (of course) give you credit! xoxo.